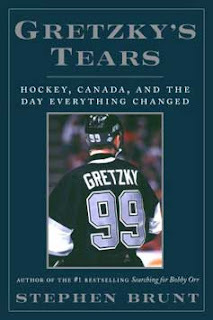 Gretzky's Tears by Stephen Brunt: $4.99 - 86% off! The Golden Jet by Bobby Hull: $5.00 - 86% off! Gretzky to Lemieux: 87 Canada Cup: $6.99 80% off! Honoured Canadiens: Hockey Hall of Fame: 12.99 - 71% off! Saving Face: The Art and History of the Goalie Mask: $12.99 - 69% off! Canucks Legends: Vancouver's Hockey Heroes: $9.99 - 80% off! Maple Leafs Top 100: The Greatest Players in Toronto Maple Leafs History: $9.99 - 80% off! My Greatest Day by Hockey Night in Canada - $6.99 - 79% off! The Rookie: A Season with Sidney Crosby: $5.99 - 80% off! Be sure to check out the Chapters bargain book section for these and more deals!